I just introduced a new rescue strawberry in with my other 5 straws. I dipped him if the freshwater pool and let him begin exploring his new environment while I changed out their foods. The new guy came to the food instantly then a minute or two later Beez came over to him off the wheel and started grabbing at his shell. I broke it up and they scattered. By the time I sat down on the couch a few feet away I heard chirping and we're at it again next to the wheel. I just did a count and have approximately 18 various shells for these guys. They are all comparable or +/- 1/8" to 1/4" in size to the size both the fighters currently have. The only thing that changed inside the tank aside from the typical food and water changes is the new guy. These Wyze cams are the best thing ever because I caught the first incident on video. As soon as saw what was going on I separated them and checked the video to see what was going on. I cut the beginning to get to the fight. Summed up new guy came to the food dish dude in the wheel watched him eat a few minutes. Wheel guy came off the wheel took a few bites of food then attached the new guy. I'm 99% sure this was a shell fight and not a pecking order argument. I believe I did the right thing by breaking it up. That’s so scary. I wonder what makes them decide that another’s shell is better than theirs, especially with so many other shells available. I hope they are ok, sending peaceful crabby vibes to Beez. Its crazy how hostile and aggressive they can be. This is captivity too where they can have a choice of several. In the wild several crabs may fight over a single shell I'm sure they would be nasty. The good vibes may have worked. I added a few more shells along with dipping all the shells in salt water and Beelz finally decided to switch! Now there are a few crabs checking out shells. I'm hoping they are done now. Straws modify their shells, so having the opportunity to get a pre-made home and not having to spend all that energy on doing it themselves is a huge bonus. Studies have shown that a lot of their decisions come down to energy conservation, as that means they have more reserves to molt and grow larger. Is it possible to modify shells yourself? I believe when they say modified it's when they remove the center of the shell so it's all opened rather than being spiraled. Straws also chip out the opening for their eyes and legs. If someone was dedicated and had tiny tools and a lot of patience and a steady hand, I'm sure it could be done by a human. But we really aren't sure exactly why they do it and what they're looking for. That would explain why some of their original shells looked like they were tossed out of a car going 70mph. Chips and chunks taken out everywhere. I love this!!! It's so true!!! All of my straws changed their shells immediately when I got them. They cruise through the shell shop occasionally, but never it never appears as though they try anything on. It's only been tossed around lately due to the Indo. Diablo is still in the original shell from my original guys. He switched a few times but changed back right away. Beelz was still in the original shell but changed shortly after the fight after dipping all the shells in saltwater and adding a few more. The new guy appears to be in an original shell to since it is identical to what my guys came in and dude got his straws from the same place as me. Straws can be a handful for sure especially if you are a beginner. The best advice I can give is to do a lot of research about them. I did a lot of reading on here and bugged GotButterflies a lot with other strawberry questions I was not not sure about. I probably researched for a month and had my crabitat ready for a week or two before picking them up. Make sure you can supply a stable crabitat for temperature between 80-86 degrees and keep the humidity above 80 at all times! They also love their big water pools because they are the only ones I actually see go swimming frequently especially in the saltwater. 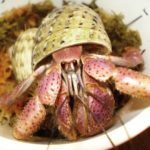 Once you have basic crab care stuff down and know how the tweak and adjust conditions they aren't too different than other crabs aside from needing more color enhancing foods in their diet and having a more stable environment. Awesome! I was hoping it wouldn’t be too much harder than that. I hate to say I’m ‘practicing’ on any animal, but you know what I am getting at there; I am looking forward to practicing for a while with the slightly more hearty crabs, and then when I’m sure the kids aren’t going to totally abandon me in time, I’ll work on setting up the second tank for sure. I think the straws and blues are so pretty, as well as some of the other more obscure breeds you don’t see many people raising. I assume it’s as much bc they simply don’t adapt to captivity well, or similar. Either way, I’m looking forward to more- of any sort!